Finnish tenor Tuomas Katajala possesses a beautiful and high lyric tenor voice which adapts easily across a wide spectrum of repertoire. He studied at the Sibelius-Academy in Helsinki and continued his studies at the Udo Reinemann´s International Lied Masterclass at the Conservatory of Amsterdam as well as Alberto Zedda´s Accademia Rossiniana in Pesaro. Katajala has been a member of the ensemble of Finnish National Opera from 2009 until the end of the season 2013/2014 where he performed in productions like G. Rossini: Il barbiere di Siviglia /Count Almaviva, La Cenerentola / Don Ramiro, Il Viaggio a Reims / Count Libenskof, G. Donizetti: L´elisir d´amore / Nemorino, Don Pasquale / Ernesto, W. A. Mozart: Die Zauberflöte / Tamino, Don Giovanni / Don Ottavio, Cosi fan tutte / Ferrando, G. Verdi: Falstaff / Fenton, G. Puccini: Gianni Schicchi / Rinuccio, B. Britten: Albert Herring / Albert, K. Saariaho: Adriana Mater / Yonas and J. Reinvere: Purge / Hans. Guest engagements have led him to the Norwegian National Opera (Il barbiere di Siviglia / Count Almaviva, Don Pasquale / Ernesto, Die Schweigsame Frau / Henry Morosus), Nationale Reisopera (Don Pasquale / Ernesto), Deutsche Oper am Rhein (Cosi fan tutte / Ferrando), Savonlinna Opera Festival (Die Zauberflöte / Tamino) and Finnish Chamber Opera (P. Glass: The Fall of the House of Usher / Roderick Usher, G. F. Händel: Acis and Galatea/ Acis). 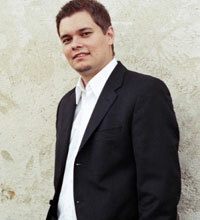 Tuomas Katajala makes also remarkable career as a concert and oratorio singer. He has almost 90 pieces on his concert and oratorio repertory including the major works of J.S. Bach, G.F. Händel, W.A. Mozart, J. Haydn, F. Mendelssohn and G. Rossini. He has performed in several music festivals like La Folle Journee -festival in Tokyo, Annecy Classic Festival, D´Auvers sur Oise-festival, Kuhmo Camber Music festival and also in the Royal Albert Hall in London (G. Verdi´s Requiem). He has worked with Andrew Lawrence-King, Kent Nagano, Esa-Pekka Salonen, Yoel Levi, Peter Schreier, Howard Arman, Hannu Lintu, David Wilcocks, Mikko Franck, Hugh Wolff, Aapo Häkkinen, Laurence Equilbey, John Fiore, Roy Goodman, Andres Mustonen, Jun Märkl and Sakari Oramo. His recent concert highlights include Händel´s Acis and Galatea with Carsten Schmidt and Mozart´s Zaide with Nicholas Daniel in Kuhmo Chamber Music Festival, K. Penderecki´s The Polish Requiem with K. Penderecki in Naantali Music Festival, D. Sostakovits´ Suite on Finnish Themes with Vladimir Ashkenazy and Helsinki Philharmonic Orchestra in Helsinki Music Centre (also recorded by Ondine), L.V. Beethoven´s 9th Symphony with Hannu Lintu and Finnish RSO in Helsinki Music Centre. D. Sostakovits´Suite on Finnish Themes with St. Petersburgh Philharmonic Orchestra and Nikolai Alexeen in Philharmonic Grand Hall in St. Petersburgh. Tuomas Katajala´s upcoming opera engagements include Tamino / Die Zauberflöte at the Savonlinna Opera Festival, Count Almaviva / Il barbiere di Siviglia at the Norwegian National Opera, David / Die Meistersinger von Nürnberg at the Finnish National Opera, Ernesto / Don Pasquale at the Glyndebourne Touring Opera. Katajala was awarded the Martti Talvela -stipend 2005, Karita Mattila -prize 2009 and The Sibelius Birthplace Medal 2011.